Mozambique to most American’s is a place of mystery. We had heard of the country and had a vague sense of its coastline, the history as a former Portuguese colony, and having just survived a long civil war. 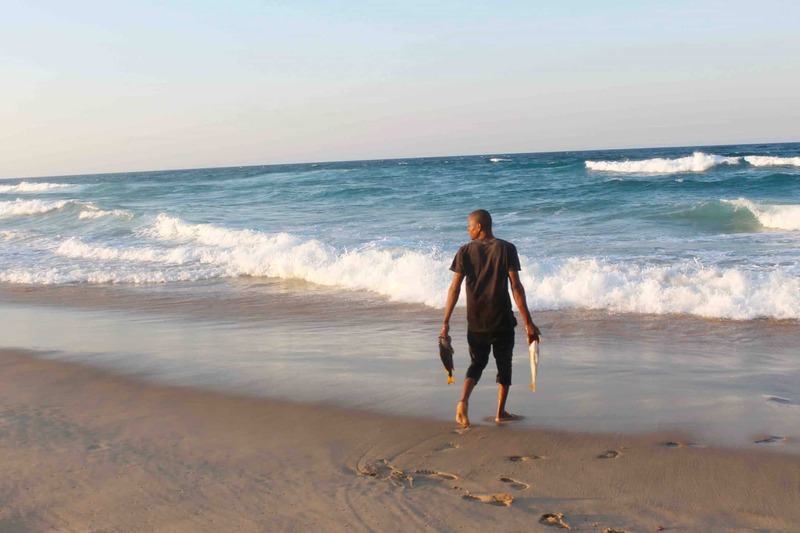 With what little information we had we set out to explore some of Mozambique’s 3,700km of coastline. Information about Mozambique by no means came from the traditional sources we use when we prepare to travel. Our best sources were from other travelers once we had landed in South Africa, a few blog posts, friends, and even Facebook groups dedicated to spending a holiday in Mozambique. Mozambique is the sort of place that scares most people away. The logistics may not always easy, but there are ways around that, and for the adventurous you’re sure to find what you’re looking for. We certainly found all of that on our first stop in Mozambique. Our destination was the Maputo Elephant Reserve; however, getting there in our bakkie was half the battle. We headed deep into the Maputo Elephant Reserve to a remote lodge that had promises of beautiful secluded beaches. After hours of driving through sandy roads, potholed roads, we came to a stop as night had fallen and we parked in thick coastal bush. We walked down a narrow path of low coastal trees with the slight sound of wind. Not until 30m out did we hear the waves. Out on the beach we found the “camp,” so to speak. 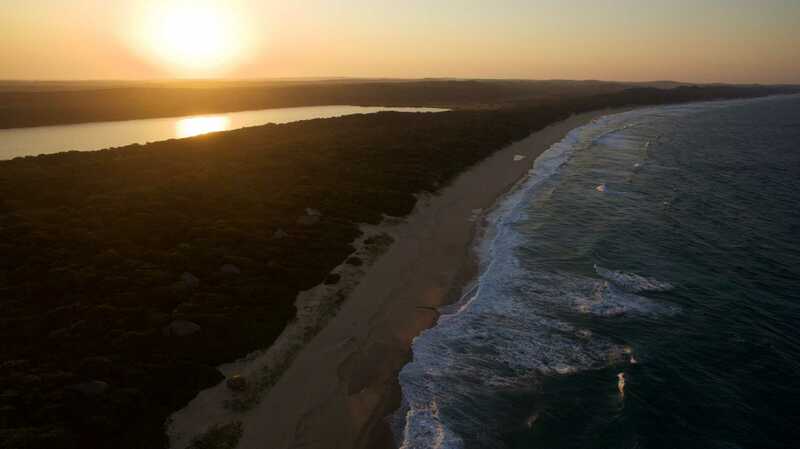 Several tents lined along the beach with a full bar, dining area, handmade canvas seats, a roaring fire, and kilometers and kilometers of unspoiled Mozambican coastline. 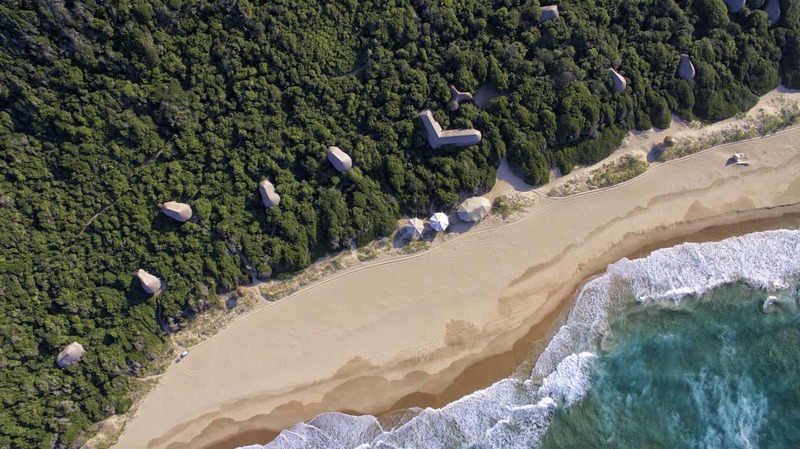 Anvil Bay is a collection of casinhas, or little huts, nestled within the coastal forests of Mozambique. 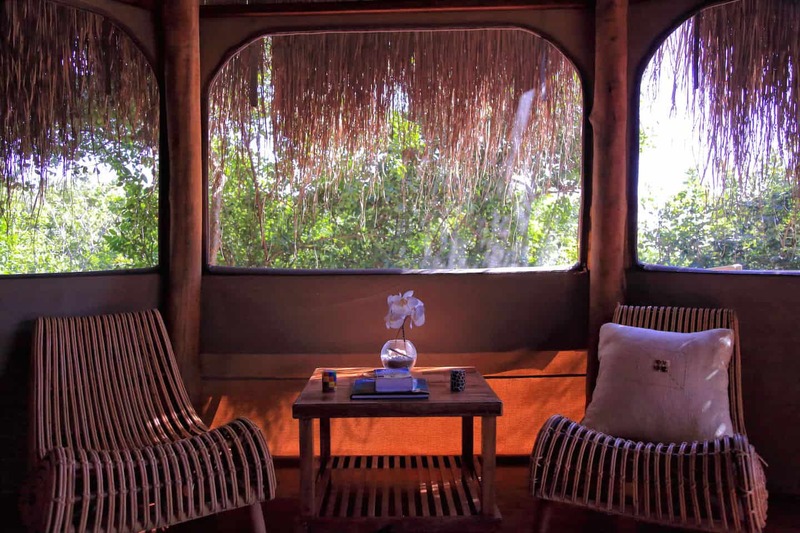 It is a secluded beach camp located along the Southern Mozambique coastline in the protected wilderness region of the Maputo Special Reserve. Which is home to a collection of Africa’s last coastal elephants and various other wildlife as they are reintroduced to the reserve. The camp was built with the smallest footprint possible on the environment and is quite literally a camp. However, it is unlike any beach camp we had visited before. For instance, that bit I mentioned about avoiding the travel woes of Mozambique, one can book a helicopter transfer right from Maputo to the resort providing mesmerizing views along the way. 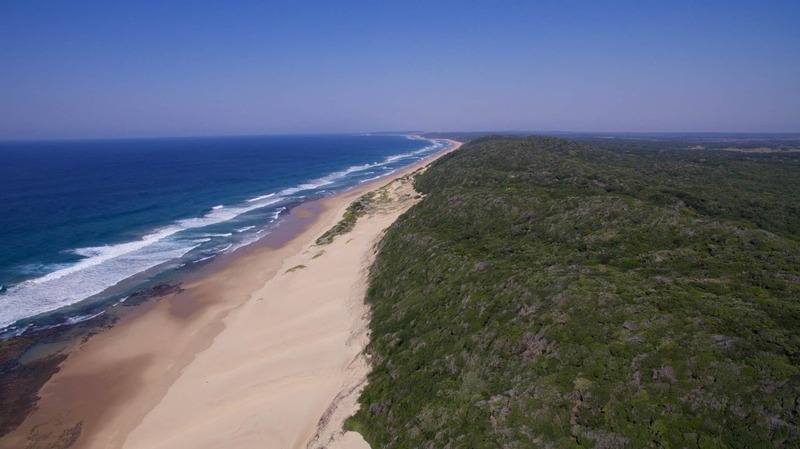 The beauty of Anvil Bay is its goal of being low impact on the beautiful coast of Mozambique. We often write about ECO-friendly tourism on our blog, and a true care for this was obviously on display. It was something we found elsewhere on the Mozambican coast, and clearly the new model for building a lodge meant to highlight its environment. Very few are coming to Mozambique because it is the new Miami Beach or Cannes or even The Seychelles. You come for the pristine and remote coastline, tranquil environment, exoticism, adventure, wildlife, and the beaches. That’s building into the environment, not over it! 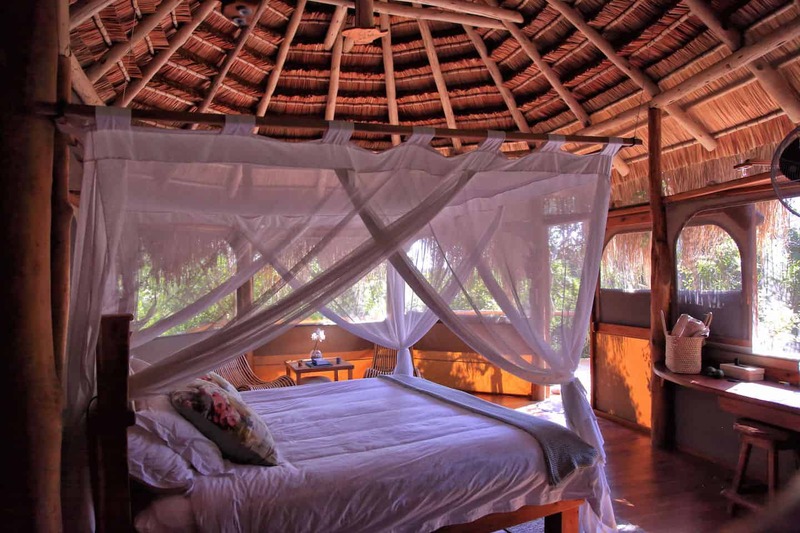 Our casinha was room number one and tucked away in the canopy of the coastal forest. The room had canvas sides that opened up on all sides allowing you to truly take in the beauty of nature. Early morning sounds in our room were that of dozens of bird species, waves, and the ocean breeze. The most notable feature of the room was the woodwork and native elements. Everything was built with local labor, and a skilled carpenter designed and built the unique furniture. Nighttime was under a vaulted thatched roof and our bathroom was replete with stained wood. We still haven’t stopped referencing Robinson Crusoe when referring to our stay at Anvil Bay. A short walk down a pathway through the coastal forest led to our outdoor shower and onto the beach. Mornings were spent walking the beach to camp where we would have breakfast in the beautiful campsite. Anyone that knows us knows that we are total foodies. So the delicious food here certainly did not disappoint and highlighted the environment we were in. We had tropical fruits grown in Mozambique and fresh caught fish almost everyday. Our first evening in even started off with fresh sashimi from fish caught that day, much to Tasha’s delight. A full bar and a barman who made some wonderful cappuccinos kept us happy too (we like coffee). While here on the coast of Mozambique there was no going hungry and no bland food that the African continent can be so notorious for. What To You Do With No One Around? Long walks and long books. A secluded and quiet beach is perfect for tuning out. Forget about the morning newspaper or television (No TV’s at all) and relax in the fact that while in Anvil Bay that is the extent of your world. There’s little to no cell reception here and certainly no tourist to disturb your peace. We even ditched the internet for a few days (gasp!) Life here is relaxation at its best. Just because you’re tuning out doesn’t mean you need to sit on the beach the whole time. There is no shortage of active things to do for those who don’t want to just take in the atmosphere. Hikes through the bush where you can spot numerous coastal birds and rare glimpses of returning wildlife were definitely an African treat. A fleet of sand bikes gave us wheels to explore the coastline and let us get our fitness on. No need to worry about anyone watching, we biked for kilometers along the beach with absolutely no one around. A natural reef is located only 200m off the beach and taking one of the boats out to explore the marine life is as simple as having to ask. They have all of the equipment needed and even wetsuits for the cold days. Want more water activities? Body boards, kayaks, and stand up paddle boards are also sure to entertain. Or you can try your hand at catching dinner with some of the staff, big game fish are located just off shore. Seclusion. That’s the best way to describe our experience at Anvil Bay. The beaches here are empty, quiet, and untouched. Anvil Bay is marketed as a private barefoot wilderness experience and that is exactly what it is. The only footprints on the beach you’ll find here are your own. If you’re looking to unwind after a tour through Africa or have an escapism vacation, relaxing here on the beaches of Mozambique will be sure to satisfy. We found great solace while at Anvil Bay. It was a special experience that we will certainly take with us where ever we go, and will likely go unrivaled.